When searching the perfect theme for a children’s website, you shouldn’t just choose a design that kids would love. Don’t forget that often, your target audience should be adults as well — especially if it’s a website for a daycare center, a preschool, or even an eCommerce site for kids toys. However, that doesn’t mean you can’t make the design look playful and fun. Because you still need the website design to match your business or organization. And you must find a theme that goes along nicely with your services and products. This will put you in a tough position when selecting a WordPress theme for your new kids website. You can’t just randomly pick a theme. You need a theme that grabs the attention of the adults while also portraying the kid-friendly side of your business. We’re here to help make that process easier for you. Simply follow these tips when searching for your kids website theme and you’ll be able to find the perfect design! What’s the first thing that comes to your mind when you think of kids or even your own childhood? It’s the colors! Lots of crayons, drawings, coloring books, and colorful building blocks. Those colorful objects and activities define our childhood. And the same idea can be applied for your kids website. When a parent visits your kindergarten website or the kids toy store, you should be able to take them back to their own childhood and remind them of their kids. A theme filled with beautiful vibrant colors will help make that happen. But first, you should forget about those popular design trends like flat color palettes, minimalist designs, and material design. Those trends don’t apply to kids websites. This might be a good time for you to also study up on the psychology of color and figure out the most playful and fun colors for your website theme. Your WordPress theme should also be focused more on images instead of textual content. The design should allow you to show lots of images of kids participating in different activities, having fun, learning, and enjoying themselves. Everyone loves kids. You just can’t resist their smile. Make your visitors melt in cuteness by showing lots of images of kids. Most kids website themes are optimized for this feature so finding one that fits this requirement won’t be too difficult. 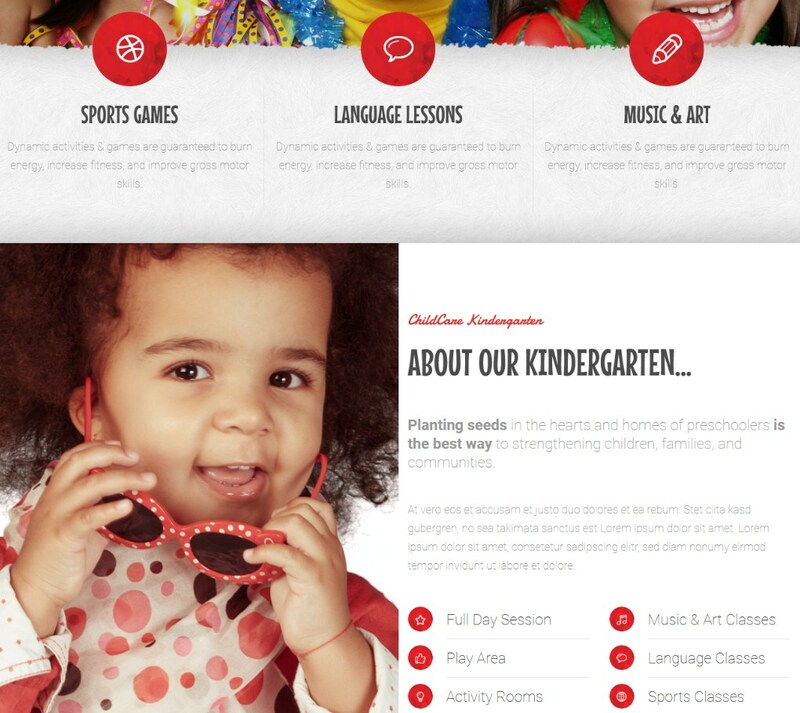 An events page is a must-have for every preschool and daycare website. This will allow people to keep track of the things happening in their kids’ schools and learn more about upcoming events while saving a trip to the school office. 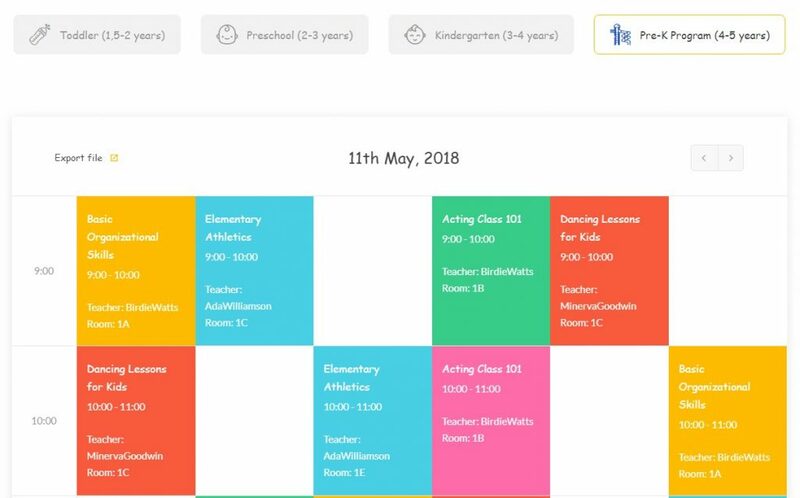 If you’re building a website for a daycare center, you could also turn this events page into a booking/scheduling calendar where parents can book specific child care providers or nannies ahead of time. 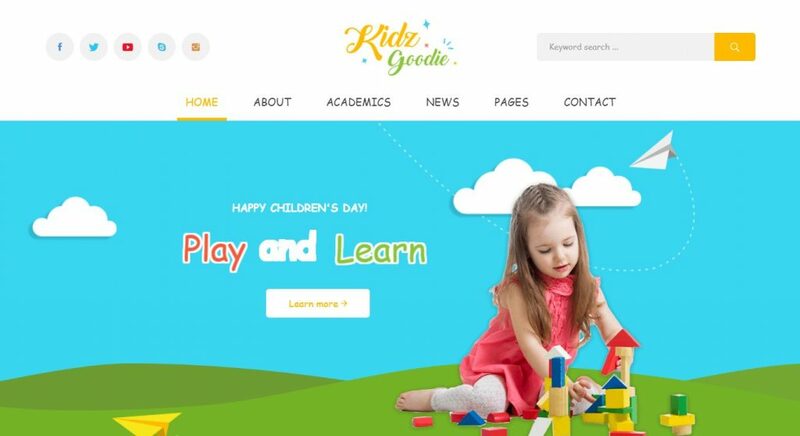 The Goodiez WordPress theme comes with a great booking calendar that seems perfect for a daycare center website. Even though a shop section is not mandatory for a children’s website, you could still benefit from it by letting people buy products for their kids directly from your website and have them delivered to their homes. This is a must-have feature if you’re making an online store to sell children’s products like toys and clothing. 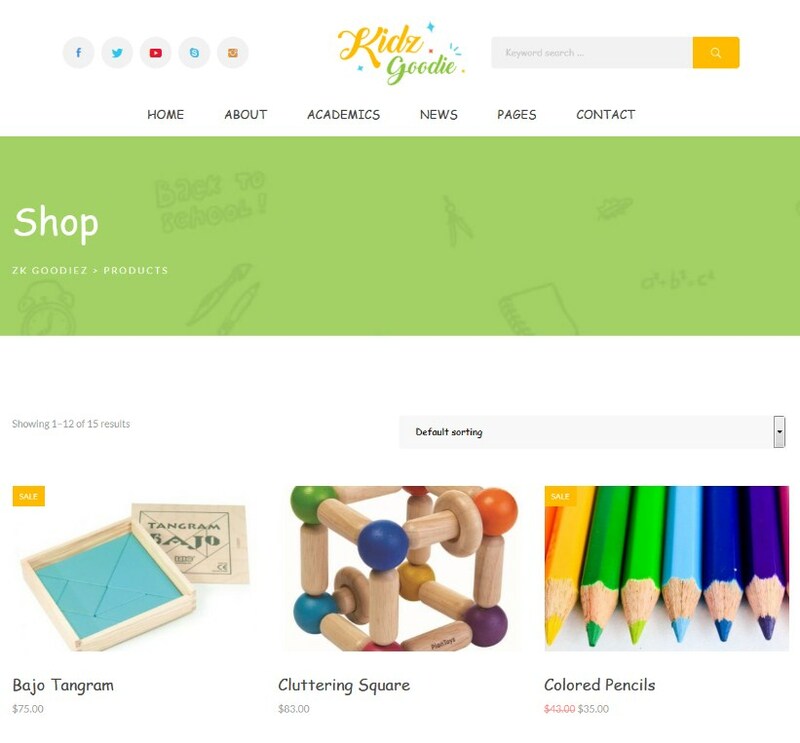 You’ll need a theme that has a colorful shop layout with clear pricing and a smooth checkout system. Every preschool and daycare center host events and special activities around the year. These activities help promote how much they care about the well-being of the children and keeping them entertained. This is a strong selling point that you should clearly showcase on your website as well. Which is why you need a beautifully designed gallery or a portfolio page on your kids website to showcase the photos and videos from your events. Show the parents how much fun kids are having at your preschool and also make it an opportunity to show off your playground to the kids as well. What kind of services do you offer at your daycare center? Do you host kids parties? Parents will want to know about this information. Why make them go through all the trouble of calling your office when you can let them learn about your services all by themselves? Make sure your WordPress theme has a great services page to include clear information about the services you offer. Keep things short and add more visuals to make the page attractive. 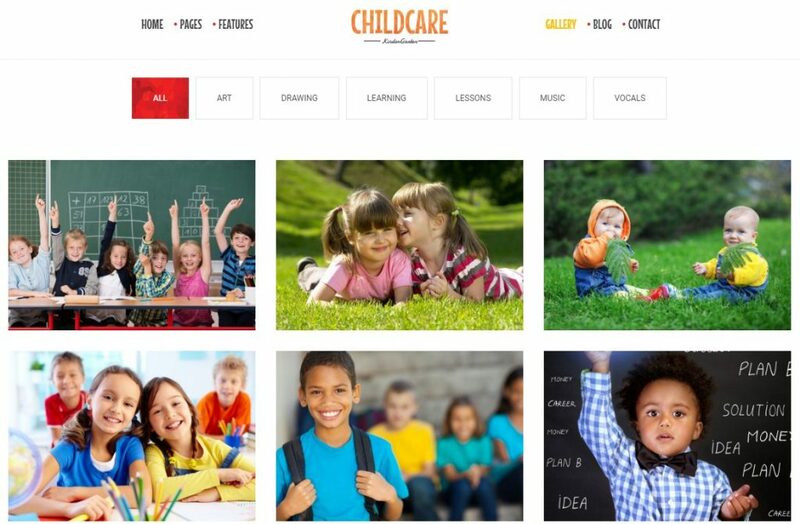 The Child Care theme has a services page that does the job perfectly. You can also include an activities page to showcase what kind of activities you have planned for the kids throughout the day. This is a great way to be more transparent about how your preschool or daycare center do things so the parents can feel safer knowing what the kids are doing during specific times of the day. Where To Look For A Theme? So, now you know how to spot a great children’s theme. What’s next? Where can you find themes of the highest quality? Well, there’s no need to go exploring marketplaces or searching on Google. We already handpicked over 7 of the best WordPress themes for children and kids websites. You should start your search there! I have observed that of all sorts of insurance, health care insurance is the most debatable because of the clash between the insurance policies company’s necessity to remain making money and the client’s need to have insurance plan. Insurance companies’ commission rates on wellbeing plans are certainly low, therefore some firms struggle to make a profit. Thanks for the strategies you share through this site. Hello my loved one! I want to say that this post is awesome, nice written and include approximately all vital infos. I’d like to peer more posts like this .